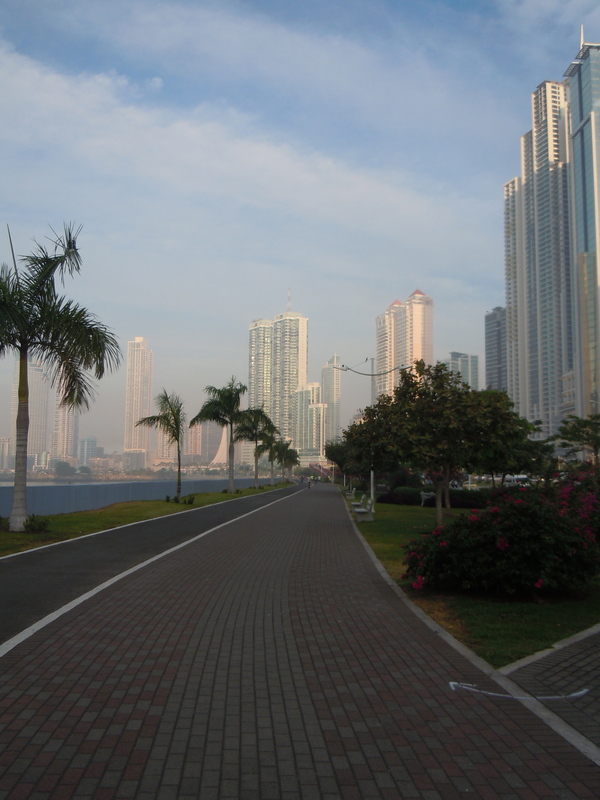 My time in Panamá is winding down. On Wednesday, my dad and I travelled from the city up to Boquete, where my dad lives, after 2 days of lots and lots of time waiting to see doctors and get tests. The verdict is still out but the surgeon he consulted seems to think there are several steps my dad can take to alleviate the pain and deterioration of his walking that appears to be the result of nerve compression in his spinal column. 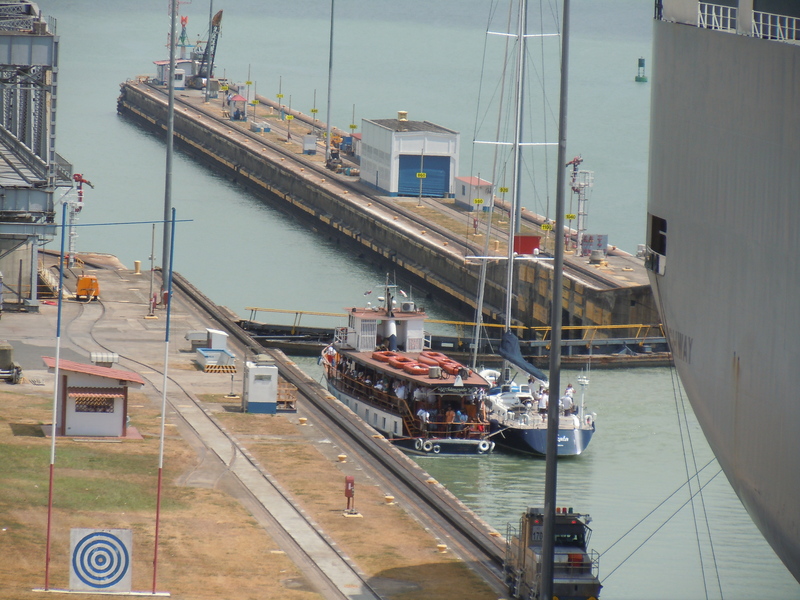 We managed to split our time between waiting around for doctors who were running late and a lovely visit to the observation deck of Miraflores Locks, part of the Panamá Canal. A tour boat, a gorgeous sailboat and a Japanese car container ship went through the locks while we were there. 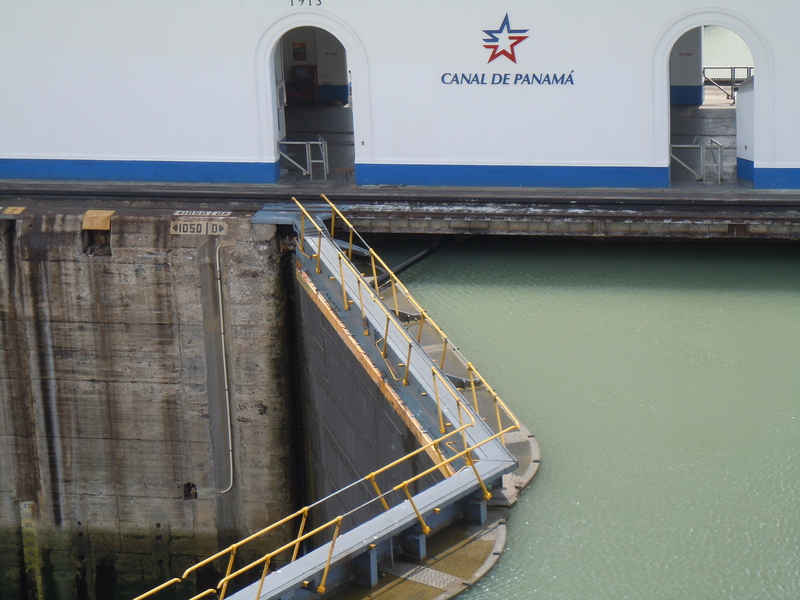 Even now, so many years after the Panamá Canal was returned to Panamanian jurisdiction, lines of demarcation between the Canal Zone and the ‘outside’ are so clearly visible. Another split. 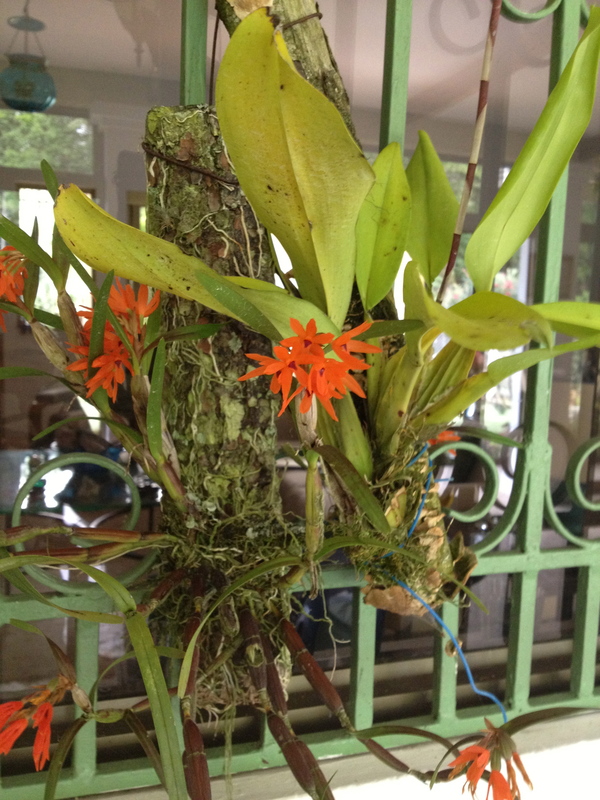 We split the city as soon as we could, boarding an Air Panama flight from Albrook Airport to the fair city of David and then driving up the side of Volcán Barú to Boquete. It is hard being here only for two days. I’ve spent enough time here these past few years to have patterns and rhythms that I slip into with my dad. I’m walking away from them this afternoon to catch a flight back to the city so I can fly to Miami tomorrow. I never quite got to leave home this time. The situation with the charge of Assault and Battery brought against Maria at her school a few weeks ago came to a head at the very end of last week, when we found out that she had been remanded to a 90-day substance abuse program with an agency that provides services to seriously delinquent youth. I got daily, sometimes hourly reports, from Sherod, navigating through a Kafkaesque labyrinth of craziness until finally, finally, late yesterday afternoon the State Attorney’s office decided to drop the charges. Our notions of innocence until proven guilty and a system of justice are quaintly antiquated, it seems, and it was only the influence and determination of two privileged parents working with an incredible support team that won that dismissal for Maria. Work is also filled with pressure as we continue to develop new revenue streams for our ministries with a very small staff and a volunteer base that is being challenged to grow in many new ways. Yesterday, conference calls, emails, and several texts with my spouseman and boss, were tucked in among preparations to host a cocktail party for 30 of my dad’s friends. Today, I am sitting in the living room filled with my mother’s presence that still aches with emptiness, learning fast and furious what I can about gondola and wall shelving units and what it costs to purchase them second hand. My dad is dozing in his recliner while I write. Bits and pieces of life like shards of colored glass. Beautiful, sharp-edged, lit on fire by the sunshine that’s been playing over the geegaws and tchotchke on my mother’s living room table. good Lord woman, it is the same room. 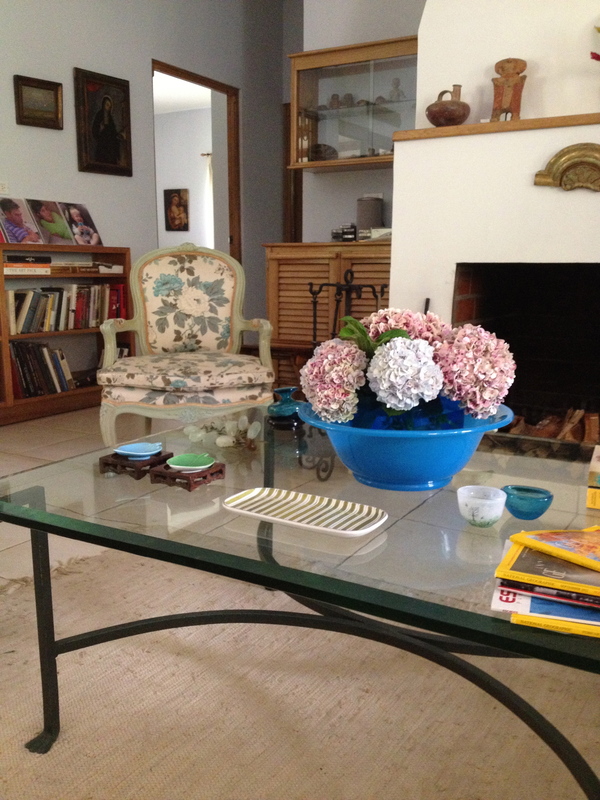 Hoosier-esque sideboard in the background, similar arrangement on coffee table, pretty flowers -though it does seem tidier without Bubba’s big feet propped against aforementioned coffee table. Funny how we slip into patterns, in such a short time when we are with those we love and in places that embrace us. I find that to be true every time I visit you (bubba clutter aside) & Mallowman, slipping into an easy groove. Miss you, enjoy those sweet hydrangeas-they do dry quite well-slip them in your luggage.